On July 14, Deputy Manager Huang Yuan and four other officials visited us as an exchange activity between Japanese and Chinese administrative officers conducted by the Agency for Cultural Affairs. They toured the Analytical Science Section of the Center for Conservation Science and Restoration Techniques on the fourth floor, the Center’s Restoration Studio on the third floor, and the Audio-Visual Documentation Section of the Department of Intangible Culture Heritage on the basement floor to learn about the survey and research performed by the National Research Institute for Cultural Properties, Tokyo. Those in charge of each facility provided explanations and answered questions. On July 23, Director Takahira and two other officials visited us to check on the current status of budget request items. They toured the Japan Center for International Cooperation in Conservation and the chemical and biological laboratories of the Center for Conservation Science and Restoration Techniques on the fourth floor, the Center’s physical laboratory on the third floor, and the server rooms on the second and third floors. Those in charge of each facility provided explanations and answered questions. From July 27 to 29, a training seminar for new staff members of the National Institutes for Cultural Heritage was held at the meeting room on the basement floor, and a variety of lectures, including customer treatment and overview of the Institutes, were presented. On the 29th, Director General Suzuki gave a lecture titled “Conceptualization of Cultural Heritage Protection and our Views thereon” and Deputy Director General Nakano gave an overview of the survey and research work conducted by the National Research Institute for Cultural Properties, Tokyo. On the 28th, the 22 new members toured the Restoration Studio of the Center for Conservation Science and Restoration Techniques on the third floor, the Library of the Department of Research Programming on the second floor, and the Audio-Visual Documentation Section of the Department of Intangible Culture Heritage on the basement floor. On the 29th, the other 20 members made the same location tour. Those in charge of each facility provided explanations and answered questions. 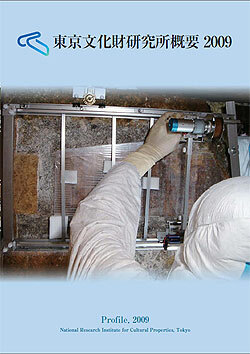 The 2009 Profile of National Research Institute for Cultural Properties, Tokyo has been published. Profile visually and comprehensively introduces the activities, training sessions, advice and instructions, graduate education, international symposiums, open lectures, transmission of information, printed publication, and other such projects featured by our Institute’s research organizations, departments, and centers in the past year. The Profile is published in Japanese and English. 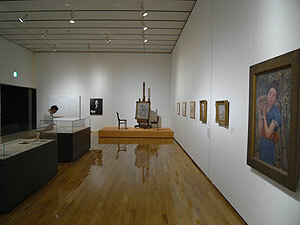 Copies of Profile are distributed to national and prefectural art galleries and museums, prefectural and government-designated city boards of education, buried cultural property centers, university libraries that have cultural property research departments, embassies, and friendship associations by one copy for each as reference material. Copies of Profile are also distributed at the Kuroda Memorial Hall and the Research Institute, together withTobunken News, for use by the general public. Profile is also posted on our Website in PDF format. Since 2006, The Department of Intangible Cultural Heritage has been participating as a research representative in the Research on Musical Instrument Collection Heirlooms of the Kishu-Tokugawa Clan, a joint research project with the National Museum of Japanese History. The Kishu-Tokugawa Clan, along with the Hikone-han, had an immense collection of Japanese traditional musical instruments at the end of the Edo Era, including many musical instruments with long histories. In July, we inserted a CCD camera into a Japanese harp and lute, observed the inscriptions written on the insides for supplementary survey, and obtained some information. Our report on this project will be presented in 2010. We held the 26th training course during a period of two weeks starting July 13, and participants included 31 curators working at museums from Iwate in the north to Okinawa in the south. The participants are specialists in various fields from archeology to contemporary art, but in these training sessions they focused on basic knowledge and technology concerning the museum environment, deterioration, and restoration of various cultural properties. 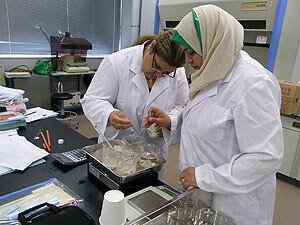 The course included lectures and practical training on conservation. 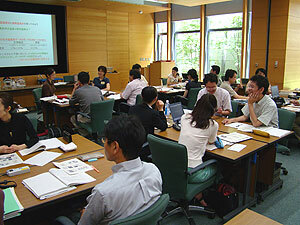 A practical museum environment training case study was carried out at the Natural History Museum and Institute, Chiba. Participants were divided into eight groups, each of which investigated the temperature, humidity, illumination, and disaster prevention equipment and presented their results the following day. This training series has now attracted a total of 597 individuals, all of whom are at the forefront of conservation of cultural properties in museums. Going forward, we will hereafter try to further enhance the training content while valuing the input of on-site professionals. 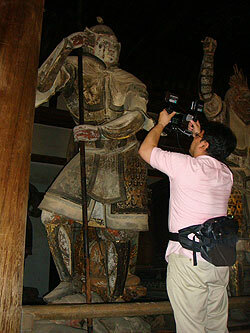 In Hokke-do at Todaiji temple, a lot of Buddha statues made of dry-lacquered and clay, including “Fukuukenjaku Kannon,” are enshrined on the shumidan. It is estimated that a major earthquake will occur in the Nara Basin, so the possibility of earthquake resistance and planning of countermeasures are important for the Buddhist statues in Hokke-do. The Center for Conservation Science and Restoration Techniques measured the 3D shpae of Buddha statues and preliminary survey for stability of the Hokke-do and its shumidan. For 3D measurement, we adopted the simple shape measurement system based on stereo camera motion photography (currently being developed by Toppan Printing Co., Ltd.). We newly applied wireless system, so safe measurement became possible on the shumidan. As a result, measurement of the six statues was completed. 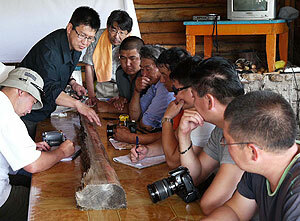 A specialist in wood structures was invited for preliminary survey for stability of the Hokke-do and its shumidan. We hope to use the results to continue the ambient vibration survey on the shumidan and temple buildings. 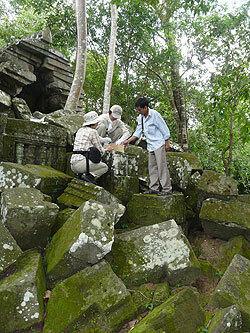 We surveyed the deterioration of the stone ruins of the Angkor Wat temple complex in Cambodia July 24 to 28. In the Ta Nei ruins, we used a new sandstone material similar to that used in the ruins and continued to survey the influence of microorganisms on the erosion of the stone by letting microorganisms flourish on the surface of the new material. The section of the stone with abundant lichen was coated with chemicals to try cleaning, and both positive and adverse effects were observed. We collected fundamental data concerning this research and study at the local site and carried out a construction experiment. We also assisted with the experiment in cleaning microorganisms on the surface of stone at the Western Prasat Top, where the National Research Institute for Cultural Properties, Nara did research, and collected data concerning the cleaning. We surveyed the deterioration of the stone ruins of the Angkor Wat temple complex in Cambodia July 24 to 28. In the Ta Nei ruins, we used a new sandstone material similar to that used in the ruins and continued to survey the influence of microorganisms on the erosion of the stone by letting microorganisms flourish on the surface of the new material. The section of the stone with abundant lichen was coated with chemicals to try cleaning, and both positive and adverse effects were observed. We collected fundamental data concerning this research and study at the local site and carried out a construction experiment. We also assisted with the experiment in cleaning microorganisms on the surface of stone at the Western Prasat Top, where the National Research Institute for Cultural Properties, Nara did research, and collected data concerning the cleaning. The Thang Long Citadel in the center of Hanoi, the capital of Vietnam, contains the ruins of buildings and section facilities of successive emperors, including the Ly Dynasty (11-13th century). A large amount of relics also were examined during the survey accompanying the rebuilding of the parliament house, and conservation support assistance will continue based on the agreement between the Japanese and Vietnamese governments. The emergency unearthing research has reached a tentative conclusion, and the significant issue is how to conserve and make use of the unearthed ruins and relics. 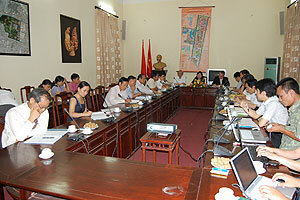 In this conference, archaeology, architecture, history, sociology, and conservation planning experts from the Japan-Vietnam Joint Expert Committee for Archaeology, Architecture, History, Sociology and Conservation visited Vietnam and discussed future cooperation with the Vietnamese members and relevant organizations. At the general meeting on July 28, representatives of the Agency for Cultural Affairs and Japanese Embassy in Vietnam also attended. We discussed both medium- and long-term plans and short-term issues, such as the millennium anniversary of the construction of the capital in Hanoi in next year and the completion of a new congress hall within three years. We agreed to provide expert support in the area of conservation of ruins and relics and arrangement and exhibit plans in addition to conventional research on the ruins’ value. This dispatch to Vietnam was conducted as part of the research using the scientific research fund of the Ministry of Education, Culture, Sports, Science and Technology. Hereafter, more effective assistance is anticipated in coordination with the UNESCO/Japanese Funds-in-Trust. 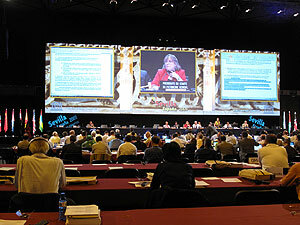 The 33rd World Heritage Committee was held in Seville, Spain from June 22 to 30. Discussions were held every day in temperatures of over 40ºC until 23:00 at an exhibition hall where sometimes wild birds wandered into and flew about. From Japan, participants included members of related government ministries and research organizations as well as local officials aiming to have their local heritage registered in the World Heritage List: Two members including myself attended from our Institute. Thirteen heritage sites (2 natural and 11 cultural) were registered in the World Heritage List, and one heritage site was deleted, so the list now includes 890 heritage sites. A high regard for human-rights related heritage was seen, as seen in the registration of heritage sites related to the slave trade. Although the final decision was made by information survey, in terms of international collaboration it seemed that nominating multiple heritage sites spanning multiple countries as one heritage site was recommended, as seen in the works of Le Corbusier, including those in the National Museum of Western Art. It was also decided to remove the Dresden Elbe Valley from the list, because immediately after it was registered, a bridge crossing the valley was planned that endangered world heritage. The bridge was not cancelled, and no specific alternative plan was proposed from Germany. This was the second time a site was deleted the list, but the first time such deletion went against the wishes of the site’s home country. Some of the discussions scheduled for this meeting were postponed to next year due to the numerous discussions about secret voting and repetitive speeches, and it seemed that there were problems in the debate proceedings. We again recognized the importance of diplomacy in the registration of world heritage through seeing changes in discussion content a conflict between two countries that have more wide-reaching issues. The Japan Center for International Cooperation in Conservation, in response to a request from the Japan International Cooperation Agency (JICA), offered technical support for the project of establishing a Conservation and Restoration Center as an affiliated organization of the Grand Egyptian Museum, which is located in Giza, Egypt. For approximately two months from July 8, 2009 to September 1, we are executing first training session for this project in order to foster human resources and transfer technology. Two trainees who work for to the Conservation and Restoration Center of the Grand Egyptian Museum, Ms.Dalia Ali Elsaid and Ms.Venice Ibrahim Attia, were selected from among 22 Egyptian conservation/restoration specialists. They are attending the training class on conservation and restoration of dyed goods together with Iraqi trainees invited to the National Research Institute for Cultural Properties, Tokyo, through grants from the Institute and the UNESCO/Japanese Funds-in-Trust and are improving their expertise accordingly. This training is performed through a combination of lecture and practicum through the cooperation of specialists from the facilities in the Joshibi University of Art and Design. As part of the networking core exchange program in Mongolia, five specialists from Japan visited Mongolia from July 20 to 29. They held a technical exchange workshop on the color painting of wooden structures at the restoration site of Bereven Monastery in Khentii Aimag Prefecture. 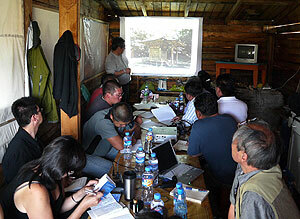 This workshop was planned jointly by the National Research Institute for Cultural Properties, Tokyo, and the Ministry of Education, Culture and Science in Mongolia (MECS), in order to improve the wooden structure conservation and repair techniques to meet the current needs of Mongolia. The first half of the workshop contained presentations and opinion exchange on the repair and restoration plan and execution of color painting, traditional repair and restoration techniques, and scientific analysis. In the latter half, we analyzed and practiced on old material of the monastery using Japanese traditional color painting. The four Mongolian participants from each organization were in charge of color painting from the National Center of Cultural Heritage (CCH) and Suld-Uul Company, which has been contracted for the conservation and repair of historical buildings. 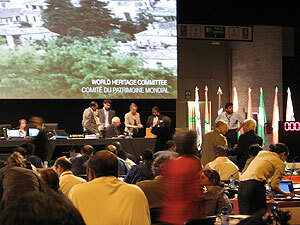 The experts who did the actual restoration from both countries exchanged opinions and found common basic principles. Although some differences were revealed, sharing this significant information will benefit future technical exchange. 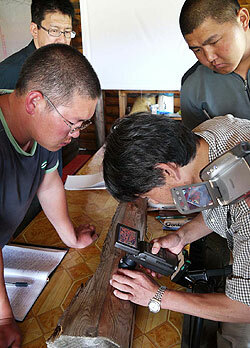 When the workshop was finished, the Japanese specialists visited the Amarbayasgalant Temple of the Selenge Aimag Prefecture in northern Mongolia, and used scientific analysis to survey the existing color coating. Through this survey, the participants became aware of the importance of sharing information on analytical methods and results, and found a desire for continued exchange between experts. We feel that we have another place where Japanese experience and technology can contribute to the conservation of Mongolian cultural heritage. The conservation and restoration course for old buildings (Program for Human Resource Development along the Silk Road) has been conducted for four months since early April at Ta’Er Monastery, a Tibetan Buddhist monastery in Qinghai. This program was successfully completed following three months of training in Beijing last autumn. 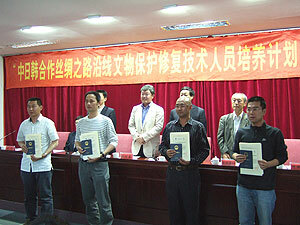 On July 31, representatives of the China State Administration of Cultural Heritage, the National Institute of Cultural Heritage, the National Research Institute for Cultural Properties, Tokyo, Qinghai Cultural Heritage Bureau, Ta’Er Monastery, and China Samsung Corporation – which had supplied funds – attended and held a closing ceremony. Twelve trainees from Shinjang, Gansu, Ningxia, Qinghai, Shanxi, and Henan provinces and autonomous regions were present. They did not necessarily have the same experiences in construction conservation, and there were some troubles in understanding the content of the training program and in getting results. However, they made use of their capabilities and helped each other get through the long training over a period of seven months. The Japanese and Chinese instructors together considered the issues that the trainees confronted and searched for solutions. These seven months made us realize how the conservation of cultural heritage requires the knowledge and techniques of many people. Last year, the trainees completed an investigation report of Beijing Gugong Zijincheng, and this year they completed an investigation report of Ta’Er Monastery as well as a practice report that summarized the twelve research papers on personal themes. They have returned to their respective organizations and are now back at their daily jobs. I hope that the training they experienced will be a bright light that will illuminate their future paths.